I recently received an article written by Ariel Crawford, who is a free lance journalist and AmeriCorps VISTA with a long-time interest in the paranormal. She writes about our friend and colleague Dr. Raymond A. Keller, who has been a guest on Arcane Radio. By Ariel Crawford - Recently I shared a ride with Dr. Raymond A. Keller, more commonly known as the “Cosmic Ray” in the extraterrestrial community, to attend an AmeriCorps VISTA (Volunteer in Service to America) conference in the Parkersburg area, sponsored by Volunteer West Virginia. Unbeknownst to me, an avid paranormal connoisseur, I am in the presence of Dr. Keller; the author of numerous articles and books about flying saucers and life on Venus. 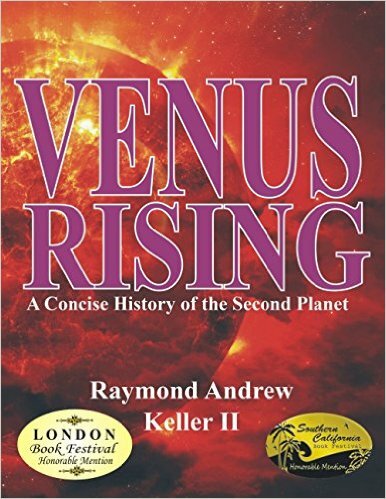 His latest book, “Venus Rising: A Concise History of the Second Planet,” was published this year by Headline Books in Terra Alta, West Virginia. It has already won two prestigious awards in the “wild card” category- at the Southern California Festival of Books in Hollywood and the London Book Festival in the United Kingdom. On the one and a half hour ride from Morgantown, West Virginia, I discovered that he is a retired professor of literature and history. The Cosmic Ray, who speaks Spanish fluently and is conversant in several other languages, earned both of his advanced degrees from West Virginia University at Morgantown, his M.A. in Latin American Literature with an emphasis on “magic realism” (2004) and his Ph.D. in African History with a dissertation focused on the diaspora of certain Imbangala warriors of Angola, in Africa, to western Venezuela. They were brought there in 1722 by the Basque pirate Captain Juan de Chourio to help protect Spanish settlements from invasion by roving bands of the Motilones Indians (2011). However, his lifelong passion has been UFO research. During his youth, he experienced a close encounter with a flying saucer in an Ohio state park. The Cosmic Ray has been writing about flying saucers ever since he was a teenager and a reporter for the Bedford Times-Register, in the suburbs of Cleveland. During the first day of the Volunteer West Virginia conference, the AmeriCorps VISTA’s took a tour of the Boys’ and Girls’ Club of Parkersburg. Here the Cosmic Ray started to talk to some children outside the Teen Center, an area of the facility that included a library. “You’ll see,” said the Venus author. “I’m going to show you how the writer of this book explains that the shortest route between two points isn’t always a straight line. He then folded the paper in half, matching the bottom and top dots and then pushed a pencil between them. “That’s very nice,” said the girl. “I never heard of such a place,” replied the other girl. “Cool,” said the other girl. AmeriCorps Vista serving Volunteer West Virginia's Veteran Community Outreach Team at Operation Welcome Home in Morgantown, West Virginia. Ariel Crawford has a Masters in Communication from Auburn University.